Der Radschläger is a Düsseldorfer tradition. In the most famous version of its origin, it refers to the legend of children performing cartwheels in the streets, celebrating the victory of John of Brabant over Henry VI, Count of Luxembourg, at Worringen, in one of the largest battles of the Middle Ages. Today the cartwheel is still celebrated across the city in sculpture, art and events, becoming a virtual symbol for Düsseldorf. 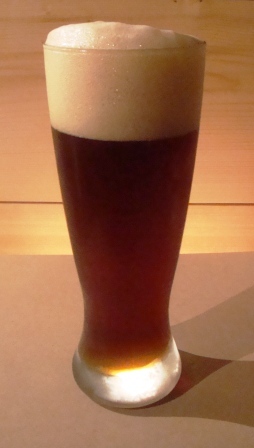 Altbier is also a Düsseldorfer tradition. This is a hoppy ale, brewed in the “alt” (old) manner, as it was before lager became the predominant style in German brewing. Over time the yeast used in Düsseldorf became acclimated to lower fermentation temperature, allowing Düsseldorf brewers to create a beer that was crisper, with less fruity flavor than the ales typical of warmer brewing regions. Altbier is brewed at cellar temperature, and then aged at a lager temperature, making it in the parlance of brewing style definition a “hybrid” beer. Alt Radschläger is a partial-mash brew, based on pale malt, Munich malt, four kinds of crystal malt, Melanoidin malt for copper color, and a portion of wheat malt. These are prepared using a triple-decoction mash schedule, to develop a rich flavor. The grains themselves were delicious while cooking. English light dry malt extract was added to this wort, along with a few grams of French sea salt. The hops were all home-grown, consisting of Nugget, Willamette, and feral Fuggle varieties from Nelson, BC. The brew was pitched with White Labs WLP036 Düsseldorf Alt yeast and cool fermented in the primary after racking off the trub. After ten days the beer was racked again and cooled to 3 Celsius, to lager for six weeks. It was then bulk-aged for six months at cellar temperature. Alt Radschläger probably qualifies as a sticke alt or “secret” ale, a stronger version that is often brewed for seasonal or special occasions. Starting at 14 Plato and finishing at 1.5, with the bottling sugar it contains about 7.2% ABV–producing a noticeable desire to turn cartwheels, even among the elderly. It is a copper-gold color with a thick, long lasting head. It has a malty aroma with just a hint of hops. The flavor shows very complex maltiness with a strong taste of caramel. Big roundness of flavor ends with a bitter finish. Alt Radschläger won a gold medal to advance to the national homebrewing championships in Seattle. One of the judges noted “If this beer was commercially available I’d buy it.” I would too! This entry was posted in Uncategorized and tagged ale, Altbier recipe, barley malt, beer, Dusseldorf, fermentation, homebrewing, Radschlager, umami.